Disappointing is how I would sum up The Adventures of Tintin: The Secret of the Unicorn (2011), its plot has something to do with a model ship and a search for hidden treasure involving an old alcoholic sea Captain and various other characters; strangely when I sat down to blog this movie I had not retained much of the story, which is why my synopsis is a little vague!! Never been a Tintin fan, more of a Beano and an Eagle lover myself but even so, can’t quite understand why the Spielberg/ Jackson money making axis decided to make the film using performance capture and why normal animation wasn’t used or even, god forbid, a standard feature film, its not as though they did not have the actors? 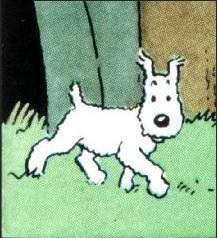 Snowy: The best thing about the film. The film started well enough with some with some nice humorous touches but wore a little thin and become over indulgent with its ‘gross out’ crash-bang-wallop conclusion. 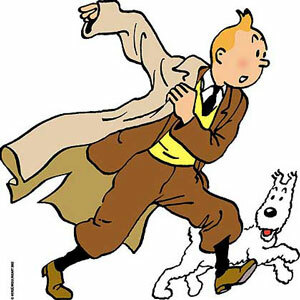 Based on the Adventures of Tintin comic books by Belgian artist Herge from whose estate Spielberg a acquired the rights in 1983. The screen play involved three British writers, Steven Moffat, best known for Dr Who, Edgar Wright, director and co-writer of Shaun of the Dead (2004) and Hot Fuzz (2005) and last but not least Attack the Block (2011) director and writer Joe Cornish. Even with all the talent involved it ended up as a cross between Raider’s of the Lost Ark and Pirates of the Caribbean but not as good as either. Bland and soporific (well I had a job staying awake!!! ).